Oakland, CA—In the wake of last week’s deadly earthquake and tsunami in Sulawesi and on the eve of the World Bank’s annual meetings, held in Bali from October 8-14, 2018, a new report from the Oakland Institute exposes the devastation caused by the World Bank’s growth-at-all-costs vision for Indonesia. For years, Indonesia has been heralded as a major economic success by the Bank and rewarded for its pro-business policy changes through the World Bank’s Doing Business reports. Between 2016 and 2018 alone, Indonesia climbed an astounding 34 positions in the ranks. These reforms, however, have come at a massive cost for both people and the planet. 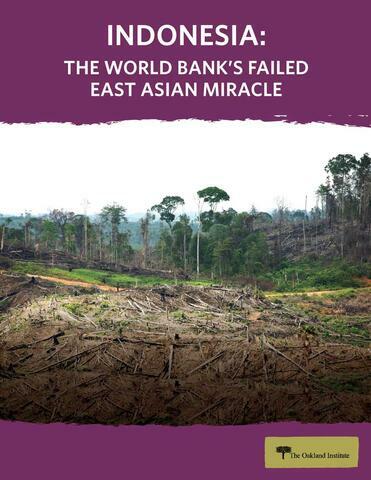 Indonesia: The World Bank’s Failed East Asian Miracle details how Bank-backed policy reforms have led to the displacement, criminalization, and even murder of smallholder farmers and indigenous defenders to make way for mega-agricultural projects. While Indonesia’s rapidly expanding palm oil sector has been heralded as a boon for the economy, its price tag includes massive deforestation, widespread loss of indigenous land, rapidly increasing greenhouse gas emissions, and more. The report’s release is also significant in the wake of last week’s twin disasters, which have claimed the lives of at least 800, in part because thousands of buildings collapsed across the island, trapping unknown numbers of people in the rubble. Today’s release is part of the global Our Land Our Business campaign, launched in 2014 by more than 280 organizations worldwide to call for an end to the Bank’s Doing Business and Enabling the Business of Agriculture ranking programs. To date, the campaign has successfully led to the withdrawal of two of the five anchor donors to the Bank’s Enabling the Business of Agriculture rankings. This new report renews global demands to end both ranking programs once and for all.